When you’re ready for a new haircut, it’s natural to consider the obvious change: layering. Layer’s can add a fresh style to an old look but they can also bring new maintenance to an old routine. If you are contemplating getting layered locks then it’s important that you first consider the pro’s and con’s before making the commitment. here are a few options for a layered hairstyle. Layers give you that new change that is often needed with a mundane hairstyle. Giving your hairstyle a change is the simplest way to gain new confidence. The best part of it all is you don’t have to loose length or spend hours in the perm chair for a new hairstyle. You can have face-framing layers which is a great way to slim, lengthen, or shorten the face shape, depending on where they begin and end in addition to their texture. They can also bring attention to your best facial features or distract from facial flaws. They can emphasize a strong jawbone or bring attention to your eyes which is the perfect way to distract from some wrinkles, scars, etc. If you have thin hair that tends to be lifeless and dull or on the other hand if you have thick hair that gets weighed down then layers could be the perfect solution. Layers provide the illusion of body and give your hair a more vibrant look with plenty of movement. Jessica Biel’s hair with one length haircut (left) and layered locks (right). Layers often need additional styling time and additional cost for styling products and salon visits. Some people, such as those with perfectly wavy locks, can get away with rolling out of bed and wearing their layers flawlessly. Unfortunately, most of us aren’t that lucky and layers might mean more time with a round brush and a blow dryer or additional hair straightening time. They also need to be ‘dusted’ or trimmed often so that they don’t become unhealthy. Hair grows an average half inch per month and when you hair is several different lengths, growing it out can be a time-consuming nightmare. Of course everybody tells you it’s “just hair” and it always grows back but you know, it’s not just hair – it’s your hair and you don’t want to be stuck with ponytails and bobby pins for the next 6 months. However, layering rarely ends up so bad that you feel the need to hide away for a few months but it does take time to grow out. Finally, this is something athletes and women who love a simple updo should consider. Layers can be difficult to keep tied back in a ponytail and they can make braids seemingly impossible. Shorter layers tend to fall out of clips and elastics but this can be avoided by keeping your layers long enough to be tied back. This is the most common type of layering, particularly for long layered haircuts. It is generally characterized by shorter layers on top and longer layers on the bottom to create length and volume on the outside of the hair. However, ‘angled’ bob is a haircut that is shorter in the back and gets longer towards the front. Also known as uniform layering, this is most common for shorter and shag hairstyles. The layers are held out at 90degrees and cut parallel so the same length around the head. A gorgeous round layered hairstyle for short hair. 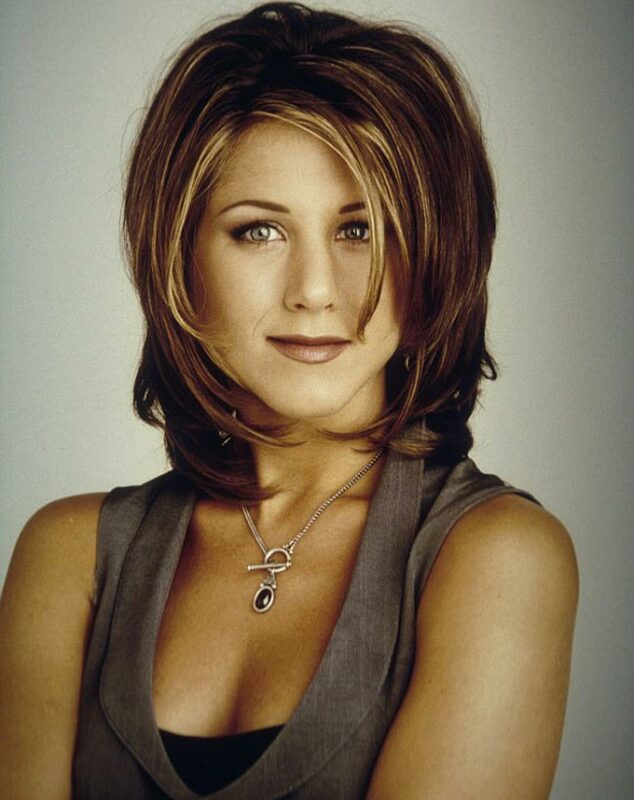 The famous “The Rachel” haircut made vertical layering popular. It is similar to round layering as the hair is cut vertical so that the hair stays the same length at the end but the crown has plenty of width and volume.